Looking for a showpiece for your garden? 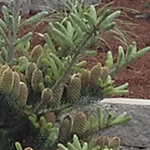 Then look to the ‘Horstmann’s Silberlocke’ Korean fir. The needles are held in whorls so the silver underside is shown as is the darker top needle giving a glistening look to the tree. It is sometimes referred to as a “flocked” noble fir. As with all true firs, the Hortsmann’s Silberlocke Fir bears upright cones near its tree top. This dwarf conifer will grow to a height of approximately 15 feet with a width of about 5 feet. It is a slow grower that increases 3-6” per year until reaching its full height. Does best in the full sun and regular watering. Watering can be reduced once it is established. Feed with a general purpose fertilizer before growth begins in the spring. Regularly available Vancouver, WA and Portland dwarf conifers from Far West Turf and Nursery.